Unit 4 – The Importance of Altitude, Azimuth and Zenith Distance in Astro Navigation. Zenith. The Zenith is an imaginary point on the celestial sphere directly above the observer. It is the point where a straight line drawn from the geocentric centre of the Earth, through the observer’s position and onwards, intersects with the celestial sphere. The Zenith Distance. The zenith distance is the angular distance from the zenith to the celestial body measured from the Earth’s centre; that is, it is the angular distance ZX in the diagram below. From this, it follows that by measuring the altitude of a celestial body, we can easily calculate the zenith distance and hence the distance to the GP. (A detailed explanation of the derivation of the relationship given above can be found in ‘Astro Navigation Demystified’). Azimuth. 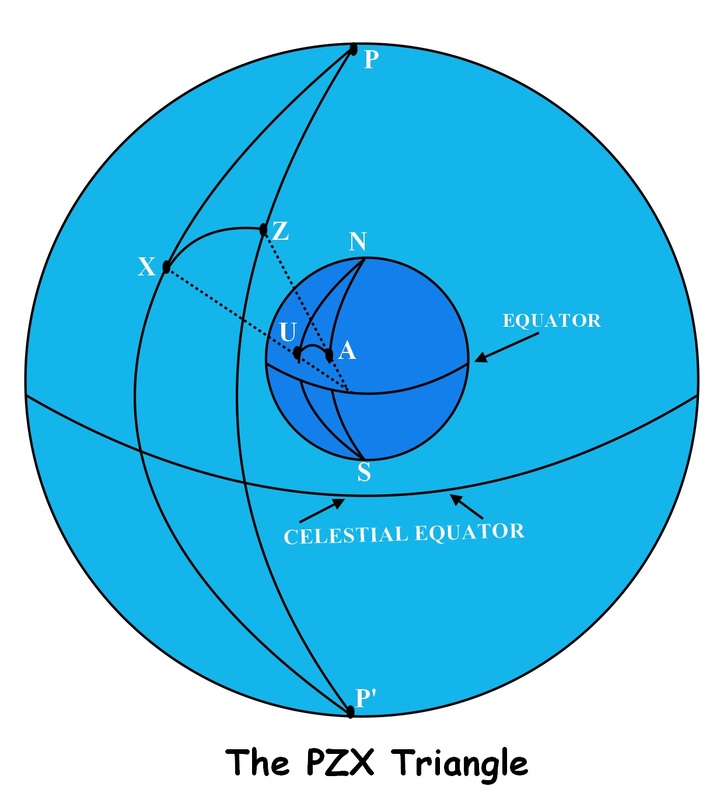 The angle PZX in the diagram is the azimuth of the celestial body and is the angular distance between the observer’s celestial meridian and the direction of the position of the body (GP). Summarizing The Role Of Altitude, Azimuth And Zenith Distance In Astro Navigation. The preceding discussions illustrate the importance of altitude and azimuth in astro navigation. It can be seen that by measuring the altitude of a celestial body, we are able to easily calculate the zenith distance which will give us the distance in nautical miles from the observer’s position to the geographical position of the body. The azimuth will give us the direction of the GP from the observer’s position. This explains why measuring the altitude and azimuth are the first steps in determining our position in astro navigation. Establishing A Position Line From The Altitude And Azimuth. Suppose we are in a yacht and we measure the altitude of the Sun and find it to be 35o; what does this tell us? All that we know is that the yacht lies somewhere on the circumference of a circle centered at the geographical position of the Sun. Such a circle is known as a ‘position circle’ since our position is known to lie somewhere on its circumference. At any point on the circumference of the circle, the altitude of the Sun will be 35o and our distance from the GP will be equal to the radius of the position circle. The problem is to establish at which precise point on the position circle the yacht lies. At first, it might seem that all we need to do is to observe the azimuth of the Sun at the same time that we measure its altitude and then draw the line of bearing on the chart along with the position circle. In this way, it would seem that our true position would correspond to the intersection of these lines on the chart. However, there is a problem with this idea which makes it impracticable. Because of the great distance of the Sun from the Earth, the radius of the position circle will be very large (approximately 3000 n.m. or so). A chart on which such a large circle could be drawn would require such a small scale that accurate position-fixing would be impossible. However, we know our dead-reckoning position (DR) which, although approximate, should be accurate to within a degree of latitude and longitude and this may give us another way of tackling the problem. We know that altitude minus 90o gives us the zenith distance and that from this we can calculate the distance of our position from the GP of the celestial body. Now, if we could work out what the altitude would have been at the D.R. position (or assumed position) at the time that the altitude was measured at the true position, we would then be able compare their respective zenith distances and so calculate the distance between them. Calculating the zenith distance of the assumed position. There are a number of methods of calculating the zenith distance at the assumed position and these include sight reduction and spherical trigonometry. Both of these methods are explained in detail in ‘Astro Navigation Demystified’. Suffice it to say that for this example we have calculated that the altitude at the assumed position is 67o.972 giving a zenith distance of 1321’.68 as calculated below. Summary. From the above calculations, we have established that the zenith distance of the true position is 1328.52 n.m. We have also established that the zenith distance of the assumed position is 1321.68 n.m.
To continue, we know that the assumed position lies somewhere on a position circle of radius 1321.68 n.m. from the GP. We also know that the true position lies somewhere on a position circle of radius 1328.52n.m. from the GP. The difference between the two position circles is 6.84 nm and this is known as the ‘intercept’. The intercept is drawn as a straight line from the assumed position along the line of the azimuth. Since the true position is further away from the GP than the assumed position, the intercept is drawn towards the reciprocal of the azimuth. 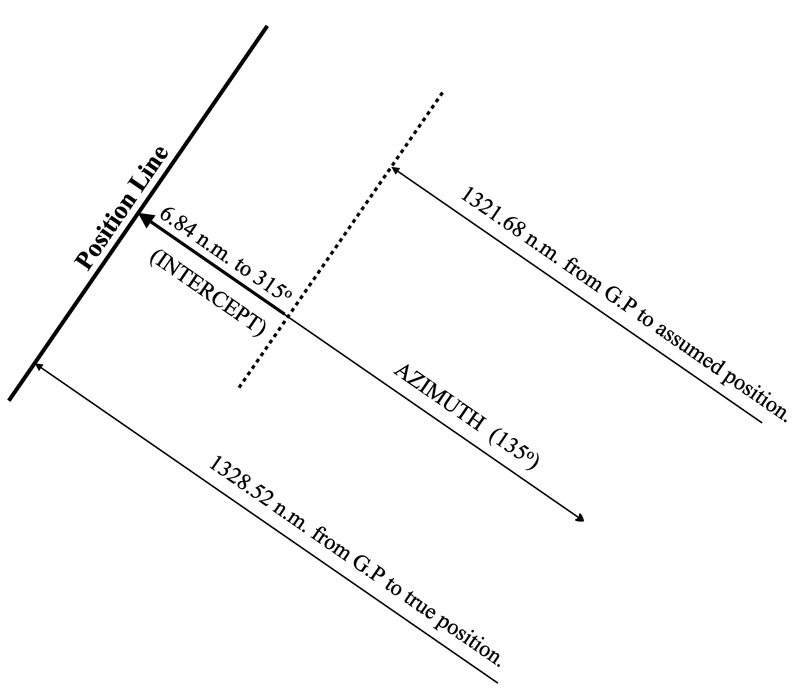 If the azimuth is N135oE (bearing 135o) then the intercept will be drawn towards N045oW (bearing 315o) as shown in the following diagram. Of course, a single position line does not constitute a fixed position; the intersection of at least two and preferably three position lines would be necessary to achieve this. ‘Astro Navigation Demystified’ explains the three point fix and also explains other methods including the ‘Marcq St. Hilaire’ and the meridian passage methods. Notes. A brief explanation of the three point fix will be given in unit 5 of this series. Units of this course are listed in numerical order under ‘Astro Nav Course’ on the menu bar. This entry was posted in astro navigation, Astro Navigation Demystified, astronomy, celestial navigation and tagged astro navigation, astro navigation course, astronomy, celestial navigation, celestial navigation training, navigation. Bookmark the permalink.